I should start by stating that, although I am from northern New Jersey, I am not Italian. Not even a little. I am, proudly, a gloriously cool mixed bag of ethnicities and cultures, but Italian is definitely not one of them. However, growing up in a predominantly Italian American town, having an Italian American stepfather, and visiting Italy twice now makes me safely say that I am an Italophile. A lot of the food I cook is Italian. Up until a few years ago I even used my stepdad’s tried and true method for checking the doneness of spaghetti–throwing it against the wall to see if it sticks. So I guess it isn’t too crazy to post a recipe for my homemade tomato sauce, a recipe that was tweaked from my mother’s, who learned hers from one of many in-laws and friends. Every few Sundays I make a big stockpot full of the stuff and freeze it in small containers. I use it for pretty much anything requiring tomato sauce. I will be using some tonight when I make Baked Penne (which is just Baked Ziti, but I prefer using penne) for dinner. I’ll probably write about that later. 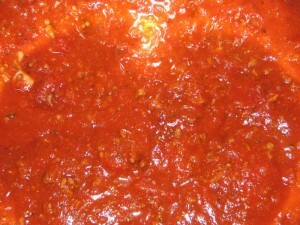 For the details on how to make this sauce, click here.